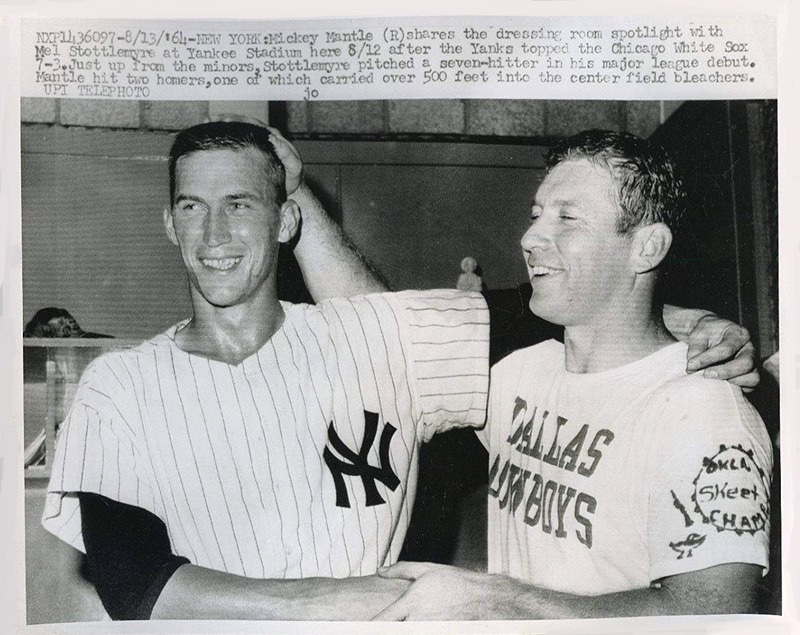 Wednesday, August 12, 1964, and Mel Stottlemyre and Mickey Mantle help celebrate Mel’s debut in the major leagues, a complete-game 7-hit shutout of the White Sox at Yankee Stadium. Passed up by the Milwaukee Braves at a tryout in 1961 because he didn’t throw hard enough, the Yankees instead took a flyer on the reserved right-hander from Mabton, WA, and when Whitey Ford went down with an injury in mid-1964, young Mel got the call. The rookie helped to stabilize the rotation as he went 9-3 with a team best 2.06 ERA as the Yankees captured the AL pennant. Mel was rewarded with 3 starts in the 1964 World Series, besting Bob Gibson in Game 2 at Sportsman’s Park with a complete game 8-3 victory. Stottlemyre’s Yankee career, though, is famously a case of bad timing, as the Yankees’ fortunes fell as he continued to rise. A 5-time All-Star in the “lean years” in the Bronx, Mel won 20 games 3 times, led the league in complete games twice, piled up 40 shutouts in his 11-year Yankee career and was an overall work horse for the Bombers, averaging 272 innings in his full seasons. Unfortunately, a torn rotator cuff in early 1974 ended his playing career prematurely, without a championship, but he made up for it in his long career as a pitching coach, with 5 rings to his ledger, one with the Mets in 1986, and four with the Yankees in 1996 and 1998-2000, a plaque in Monument Park dedicated to him in 2015. Stottlemyre was “a throwback to a winning tradition in those years of mediocrity”, said legendary sportswriter Phil Pepe. And not unlike Yankees such as Gehrig and DiMaggio before him, carried himself with a quiet dignity that we can all admire and strive to emulate. Mel was an outstanding pitcher – maybe even a borderline Hall of Famer. He won 20 games three times for Yankee teams that were mediocre at best. He was a workhorse, dependable, a class act throughout his career in baseball and gosh, he will be missed. He helped put the Yanks in the ‘ 64 WS after being called up from Richmond. From 1965- ’74, Mel was Yankee #1 as he consistently pitched his heart out in every single start. Starting in the WS his rookie year, but never to return. A shame about his ‘74 injury, may have made it to the next Yankees postseason era, but certainly did as a respected pitching coach. Beautifully said about Mel, Tom! And a nice follow by Mr. Monte, one of the all time great baseball fanatics. Everything about Mel screams: A TRIBUTE TO THE GAME. So unlike some of the arrogant, no hustle superstars today, with their obscene $$$ demands. We also lost Eli Grba on the same day. The first player to ever be picked in an expansion draft, Eli was chosen by the Los Angeles Angels in the Fall of 1960. Unfortunately, Eli battled alcoholism for years and never lived up to the achievements that Ralph Houk, a former coach of Eli’s, predicted for him. I had the pleasure of knowing Eli and I will miss his warmth, kindness and abundant baseball tales. If you ever get a chance, I highly recommend his autobiography, “Fallen Angel.” God bless him ……… and by the way, he made Bob Costas apologize for his lighthearted but uncalled for comment about an Eli Grba baseball card in the announcer’s eulogy for Mickey Mantle in 1995.